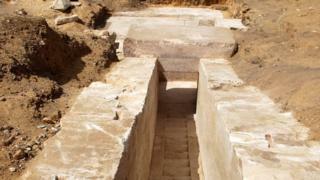 The remains of a pyramid built some 3,700 years ago have been discovered in Egypt, the antiquities ministry says. An interior corridor and a block engraved with 10 hieroglyphic lines were among the finds at the Dahshur royal necropolis, south of Cairo. The ministry said they were in very good condition and that excavation work was continuing to try to reveal more and establish the size of the pyramid. It is believed to have been built during the 13th pharaonic dynasty. Dahshur is where King Sneferu of the 4th Dynasty built ancient Egypt's first true smooth-sided pyramid, the 104m-high (341ft) Red Pyramid, about 4,600 years ago. Sneferu was succeeded by his son Khufu, the renowned builder of the Great Pyramid at Giza, which is 138m high and was a wonder of the ancient world.